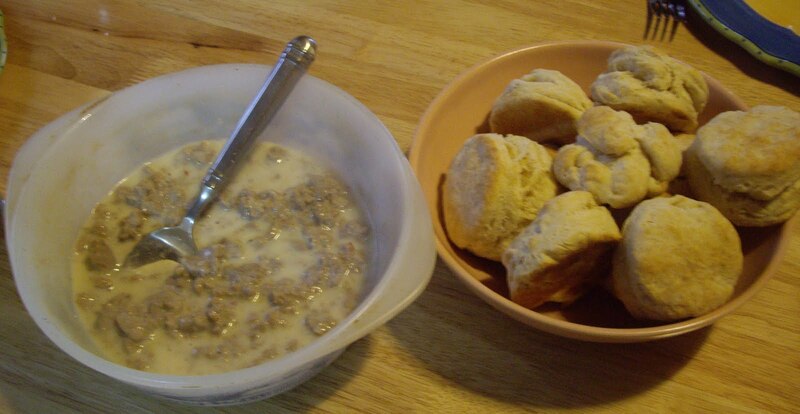 Biscuits and sausage gravy is comfort food. Make it for breakfast or supper. It’s all good. While they are baking make your sausage gravy. In a heated skillet add the sausage and water. Season with the salt and pepper. Cook the sausage and break it up into crumbles. In a jar, add the milk and flour. Cover with a tight fitting lid and shake. When the sausage is all browned and the liquid in the pan is bubbling, push the sausage to the sides of the pan and pour the milk/flour mix into the skillet. Stir constantly until the gravy bubbles and thickens. If it thickens too much too fast add a little bit of milk. If it is too thin, turn down heat and cook until as thick as you would like. You will get enough to serve 3-4 people.